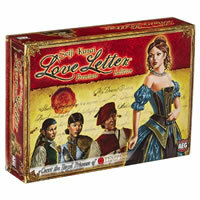 Love Letter is a unique game where they more you get into the story of the game, the more fun it is. Everyone playing is trying to woo the princess of Tempest but she's locked in the palace. She relies on you to bring her romantic letters. Everyone is trying to get their love letters to reach her first. Love Letter is a game of risk, deduction, and luck and will leave you wanting to play more and more. With only 16 cards to play with and other smaller game pieces you'll be tasked avoid getting your letters tossed in the fire. Played by many and enjoyed by thousands, give Love Letter a try today. You're trying to collect the correct amount of tokens based on the number of people playing the game. You get 16 game cards, 4 reference cards, tokens of affection and the official Love Letter game rules and instructions. Please keep in mind that the official Love Letter party rules and instructions could be different depending on the game version you have. The rules below are some of the exact directions on how to play Love Letter. Share with us your comments, funny stories, tips, advice, strategies, creative ways to play, questions about how to play, problems with the rules or anything you want about Love Letter. All submissions will be reviewed within 24 hours. Click here to add your Love Letter comments.